If you made New Year’s resolutions, odds are good you’ve already started to lose focus on them or have already broken them. New Year’s resolutions seem to last about as long as Christmas trees; on December 26 the first Christmas trees began to appear at the curb in our neighborhood, and on January 2 the first resolutions hit the dust bin. What we need are not better resolutions, maybe not any resolutions at all, but a different way of thinking about the beginning of the year or about any beginning. I gave up making New Year’s resolutions years ago – never could keep them very long and got tired of feeling guilty and frustrated about not keeping them – and now I do three other things instead. They’ve become so meaningful to me, I do them at other times of the year, too. They’ve even become part of my morning and evening prayer each day. They’re so meaningful, in fact, I feel impertinent enough to suggest them to you. First, I try to finish one year before beginning the next. I spend the last few days of the year in retreat, clearing away unfinished business, tidying up my interior life and letting go of burdens and regrets. Of course, many of the things that occupied me in the old year will be waiting for me in the new one, but having set them down for even a few days, I’m able to pick them up with a clearer sense of priorities. I have a better sense which ones are really important and which ones merely pretend to be. And some things I find I don’t need to pick up again at all. It’s a good practice for any day of the year. “Finish one day before you begin the next,” Emerson advised, “and interpose a solid wall of sleep between two. This you cannot do without temperance.” Neither can you do it without faith, deep trust in the God who is involved in all those details and at the same time is involved in something much bigger, something that often gets lost in the ordinary details of our lives. “You are worried and distracted by many things,” Jesus told Martha; “there is need of only one thing” (Luke 10:41-42). The beginning of a new day, or remembering the sabbath day and keeping it holy (Exod. 20:8), seems a good time to let go of the many things that preoccupy us and to remember the one thing that’s necessary. It’s not a bad way to start the year. Forgiving those who’ve harmed me is also part of the transition to a new year. Forgiveness is not about saying what someone did is okay. Forgiveness is about deciding I’m no longer going to carry the burden of what someone did. It says, I’m not going to let the past determine the future, I’m not going to let what happened yesterday limit what happens today or tomorrow. 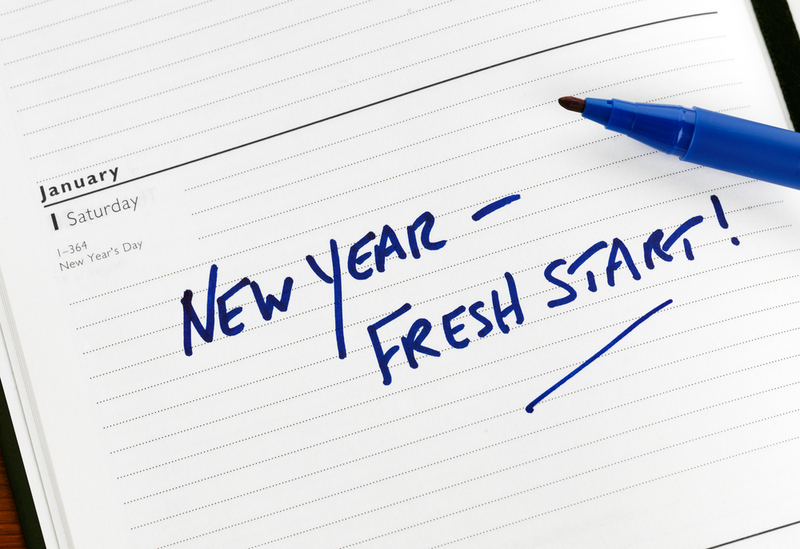 The second thing I do is look at the beginning of each new year, each new day, as an opportunity for starting over. The symbol of that for me is the brand new calendar and journal I open on New Year’s Day. It’s an opportunity to literally turn over a new leaf, wipe the slate clean and start fresh, something God is doing all the time. “The steadfast love of the Lord never ceases,” one of the ancient Hebrew songbooks affirms, “God’s mercies never come to an end; they are new every morning, as sure as the sunrise” (Lam. 3:22-23). Each sunrise is the start of an experience with God’s mercies you’ve never had before. It’s something to celebrate. When one day blurs into the next, one season into another, our senses can grow dull with the repetition, and we can lose our appreciation for what each day holds. We tend to focus on what we don’t have instead of being grateful for what we do have. Our life begins to be defined by our problems rather than by our creativity. But when we live one day at a time, when we surrender the burdens of the past and our anxieties about the future, the beauty and blessings of each day begin to show themselves, and the past and the future are transformed. “Look to this day,” an ancient scribe wrote, “for it is life, the very life of life. In its brief course lie all the truths and realities of your existence: the bliss of growth; the glory of action; the splendor of beauty. For yesterday is already a dream, and tomorrow is only a vision. But today, well lived, makes every yesterday a dream of happiness and every tomorrow a vision of hope. Look well, therefore, to this day. Such is the salutation of the dawn.” It’s also a good way to greet the new year. Finally, at the beginning of this new year, as at the beginning of each new day, remember: God has faith in you. You are here today because God has brought you here to this new beginning. And God has brought you here because God considers you an essential part of the new thing God is doing today. Twentieth-century theologian H. Richard Niebuhr believed that to love someone in the Christian sense is to value that person. It’s to trust that the person has an essential role to play in God’s unfolding creation, even if I don’t understand what that role is, and that without that person my own life would be essentially diminished. And then it is to act toward that person accordingly. To say, as we do, that God loves you is to say that God values you in the same way, that God considers you to have an essential role to play in creation, and that without you even God would be incomplete and diminished. “For I know the plans I have for you,” Jeremiah heard God say, “plans for your welfare and not for harm, plans to give you a future with hope” (Jer. 29:11). Because you are here today, you can be sure God has plans for you, God has promises for you. That’s the God who says to you, as God said to Jesus at his baptism, “You are my child, the Beloved, with you I am well pleased” (Matt. 3:17). During the next six weeks I’m going to look at some of the other promises God has for us: God’s promise to be faithful to us; the promise to use us in God’s ongoing creation; the promise of blessing, of guidance, of freedom, and of wholeness. Today, however, it’s let’s begin the new year with God’s promise of new life, God’s promise of plans for you, plans for your welfare and not for your harm, plans to give you a future filled with hope. It’s a promise we can count on.